Vista Investment Group paid $22 mil for Hollywood Station, a 69.1k sf ($318/sf), mixed-use building in Portland’s Hollywood District. The purchase represents Vista’s fourth investment in Portland, OR over the last 18 months. Hollywood Station is anchored by a 50k sf 24 Hour Fitness Super Sport Gym, which recently extended their lease for an additional 10 years. The fitness facility is one of the busiest among 24 Hour Fitness’ chain of 400 clubs throughout the country. The building also includes 17k sf of office space leased to a variety of local businesses, as well as 2k sf of street level retail. The property was 95% leased at closing. Located at 4224 NE Halsey St, the 13-year-old property is adjacent to Interstate 84 and the TriMet MAX Light Rail Hollywood/NE 42nd Avenue transit center station that serves the TriMet’s Blue, Green and Red Lines, providing convenient access throughout the greater Portland area. The property includes a covered four-story parking garage with 220 stalls. Vista Investment Group represented itself in the transaction. Blake Federinko, Brandi Ho and Michael Jenkins from MAJ Commercial represented the seller. With its acquisition of Hollywood Station, Los Angeles-based Vista has now invested more than $100 mil since entering the Portland real estate market in 2017. 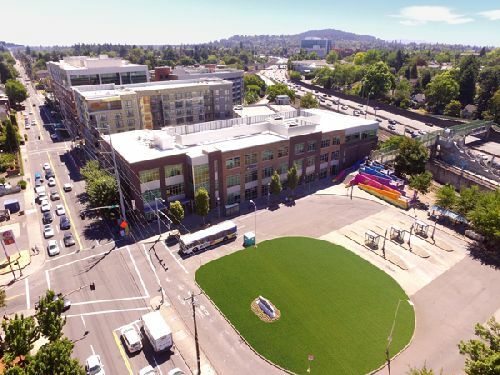 With a robust pipeline of activity behind this acquisition, Vista has already built a 500k sf-local portfolio that includes Nimbus Oaks, a flex/business park in Beaverton, Customs House in Portland, and last month’s acquisition of the Cornell West office building in Beaverton. The company’s fifth acquisition in Portland, a multifamily property in the submarket of Vancouver, WA is set to close escrow in May.